"Just like the ones we bought when I was a child." In a large bowl, cream together 1 cup white sugar and shortening until smooth. Stir in the egg yolks and molasses. Combine the flour, cream of tartar, baking soda, salt, cinnamon and ginger; stir into the molasses mixture alternately with the sour milk. Cover and chill for 30 minutes. Preheat oven to 350 degrees F (175 degrees C). On a lightly floured surface roll the dough out to 1/8 inch thickness. Cut into rectangular shapes (I like to use a Spam can). 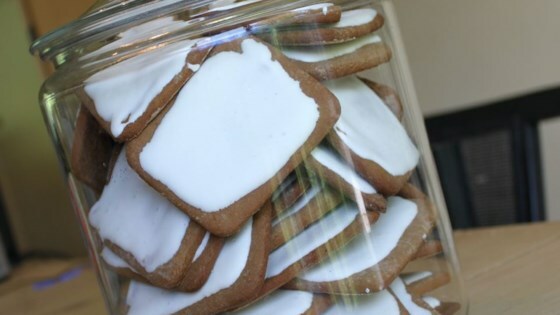 Place cookies 1 inch apart onto an ungreased baking sheet. Bake for 8 to 10 minutes in the preheated oven, until lightly browned. Remove from baking sheets to cool on wire racks. To make the frosting, combine 1 1/2 cups sugar, vinegar, water and marshmallows. Mix well and place over a pot of simmering water. when the marshmallows have melted, stir in the egg whites. Remove from heat and beat with an electric mixer for 7 minutes. Stir in the vanilla and confectioners' sugar until well blended. Frost cooled cookies. I was really disappointed. They were not a spicy ginger at all. Next time will add a LOT more ginger, but they were soft and good. Just not what I thought they would be.